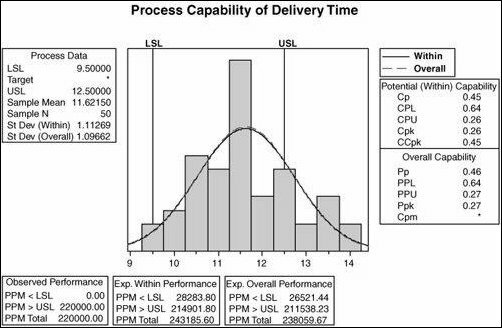 Prior to making any process changes, be sure to understand the current process capability. First define the goals and specifications. Then collect the process data. Collect at least 30 data points. To actually make a useful CpK calculation the process needs to be stable. If the process mean moves around or its variation changes unpredictably then you cannot meet customer requirements. To check stability create a histogram. If the histogram shows a bell shape curve, then consider the process normal. The Capability calculations of Cp and Cpk rely on the data being normal. Calculate Cp and Cpk as per the preceding equations. Most statistical software packages do this readily. Process Capability (expressed as Cp and Cpk) represents short-term behavior of the process. In reality processes tend to shift and drift over time. The variation stays reasonably consistent, but the mean moves to and from. Empirical process studies show that most processes tend to shift and drift about 1.5 standard deviations. Most software packages try to emulate this short-term versus long-term standard deviation by measuring it in two different ways. For long-term, the regular standard deviation of all the data is used. For short-term the value comes from an equation involving the moving average across the data. 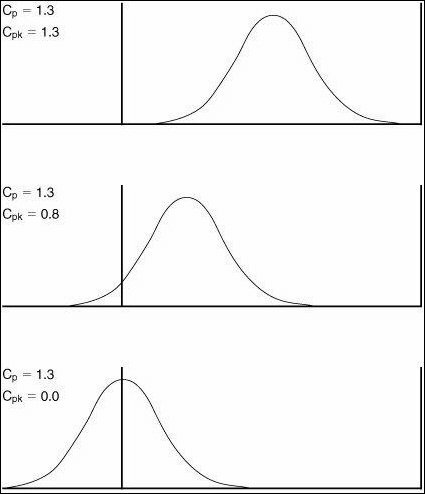 In the below figure, the within standard deviation represents short term and the overall standard deviation represents long term. The within value is used to calculate the Cp and Cpk, whereas the overall value is used to calculate the Pp and PpK. The target value for Cp in Six Sigma is 2.0 and for Ppk it is 1.5. These are not absolute requirements in any way, but if a process exhibits process capability at this level then it can be considered to be performing very well. The Observed Performance represents the PPMs of the actual data points below the LSL, above the USL, and the total of both. If no points fall outside of specification during the data collection, then the PPMs are zero. 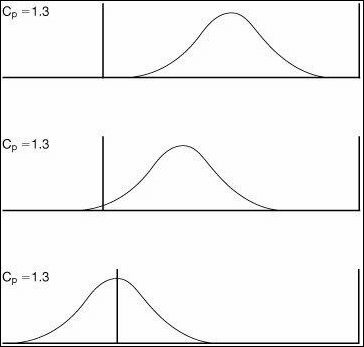 The Within Performance represents the PPMs as calculated from a normal curve with the sample mean and short-term standard deviation. The calculated curve hangs over the LSL and USL, and thus, the area under the curve outside of the specification limits gives the PPMs. These are the expected defectives on a short-term basis. The Overall Performance represents the PPMs as calculated from a normal curve with the sample mean and long-term standard deviation. The calculated curve hangs over the LSL and USL, and thus, the area under the curves outside of the specification limits gives the PPMs. These are the expected defectives on a long-term basis.